When you’re presenting live for others to watch, the first thing you need to do is make sure you’ve built an area for the event that’s free of distractions. This includes both visual and audio. Be conscious of what’s behind you. Where you stage your video isn’t as important as making sure that wherever it is there isn’t a lot going on in the background. Like a good photograph or any other video, how you frame your subject should be top of mind. If there’s a lot going on behind you (bookshelves, a TV, other people) the viewer is going to have a hard time keeping their focus on you or your subject. Simple Solution: Hang a sheet. I went live from my unfinished basement (also known as my current “office.”) It’s the best space I had available to me for my location budget ($0) and where I could be free from external distractions. But it’s an unfinished basement, with shelves of my junk, exposed concrete, etc. and is just plain distracting. So I bought a black sheet and hung it behind where I was filming. Using black was particularly good for my event since I wanted the main focus to always be me and nothing else, and it did a fantastic job of setting me as the sole subject. (Note you could also use a blank wall or a plain door, but I like the sheet as it also does a good job at absorbing and softening light). Your live event is both a visual and auditory experience for the viewer, and just like with your visuals it’s important to minimize any distraction from other noises that could cause distraction or interruption. Find a place with minimal noise to begin with, and think about what noises might pop up ahead of time so you can mitigate them ahead of time. For me that meant making sure my kids knew I was filming and that they couldn’t run around in the kitchen above me (it echoes like a herd of elephants). It also meant turning down the heat so the furnace wouldn’t kick in. While there’s something to be said about the “realism” a shaky hand-held camera can bring to an event, it can also serve as a distraction. Not only that, but you’ll be constantly thinking about if you are in frame when you should instead be focusing on what you’re providing for your viewer. Even worse, your arm will get tired of holding your phone for any extended period of time. Simple Solution: Since I was broadcasting across both Periscope and Facebook Live simultaneously, I needed to use two separate devices. For me that was my Galaxy S7 (which I used for Periscope) and my son’s iPod (Facebook Live). Using two devices also meant there was no possible way I could hold them both and hold a book at the same time. So I bought tripods and phone holders. For less than $13 per setup I bought two pairs of little tripods and cell phone mount adapters from Amazon. The mounts were universal, so they worked on both devices without problem, and since I had a table in front of where I was filming I was able to get away with using mini tripods instead of full-size ones. For the tripod I just used the Amazon Basics Lightweight Mini Tripod and for the mount I used the Vastar Universal Cell Phone Tripod Mount Adapter. Once I had them all together I set up a stool where I planned to sit and put up a piece of tape behind my head to use as a mark. Then I went over to the cameras and set the angles so I’d be looking where the tape mark was as my focus area. Lastly I asked my wife to come down and double-check the angles while I sat in the chair and she made a few final adjustments. Earlier I mentioned the importance of minimizing background noise, but there’s more to a quality livestream than just that. You also have to make sure your viewers can hear you clearly! In a lot of instances the microphone on your phone will suffice, but really it’s not a very good mic. And if you’re setting up an event where you won’t be within a few feet of your device, you’re going to have some serious audio quality issues. For my event I was 6-7 feet away and there was no way the built-in mic was going to give me the quality I needed. Simple Solution: Buy a clip-on / lavalier mic. Especially one with a long cord (or get an extender). I bought a pair from Purple Panda on Amazon and I couldn’t be happier. The quality was night and day versus the built-in mics on the phones and the extra long cables gave me the ability to be “animated ” while I read. For just $25 each they’re a total steal – plus they even come with a windbreak if you are recording outside. No, I’m not saying you should have a few drinks before going on (in fact, I personally recommend against it). But what I am saying is you need to make sure your lighting is at least “decent.” Think about how bright you want to be on screen, where you want shadows to lie, and how your clothing is going to look in the light (and against your backdrop). Simple Solution: Turn off your overhead lights and use lamps. I grabbed a few lamps from around the house and took off the shades to go with bare bulbs, then adjusted their elevation and distance until I found what I thought looked decent. Be sure to use more than one light source though. You need light coming from more than one place unless you want some really drastic shadows. I had three different sources on me and it worked out pretty good. Bonus Tip: I’ll get to this a little more next, but if you can, set up a third camera that can display back to you what the other cameras are seeing so you can use it as a kind of monitor. I used moved my webcam from my PC over to where I was filming, left it connected to my PC, and rotated the monitor so I could see myself on-screen the whole time. It helped a lot in making sure the lighting was how I wanted as well. There’s one issue I have with going live, and that’s the fact that once you’re live it’s over. Yes, Facebook and Periscope save your videos for future viewing … but (and you can call me paranoid) I don’t trust Facebook and Periscope to keep my video forever. So for any larger event, particularly one you’d like to revisit or repurpose, set up a third camera and mic for your own copy. Simple Solution: As I mentioned earlier, I used my webcam for this and I just recorded using the regular webcam software. I did also use my awesome Blue Yeti mic and the Amazon Mic Boom so I could record at very high quality, but that’s not necessary unless you want something really nice to use later on. (I wanted something to remaster and share to YouTube and possibly even edit into an audiobook). But it’s not absolutely necessary. Bonus Tip: Test Ahead of Time! As much as technology is supposed to “just work” we all know it doesn’t always do what it’s told. Even if you think you have everything set up properly, you absolutely should test each device and platform individually before going live for the big show. I ran into some mic issues I wouldn’t have noticed (I didn’t have the jack all the way plugged in) and I also had some Internet connection issues (resetting my router took care of it). But other than technical issues you do want to also make sure your audio levels are set right and that once you start filming the lights look how you thought they would. Since I try to have a personal connection with my followers I “went live” early and asked for feedback. They gave me a few notes and I took care of them ahead of time so I was all set for when the real event kicked off. Have You Gone Live What Can You Share? 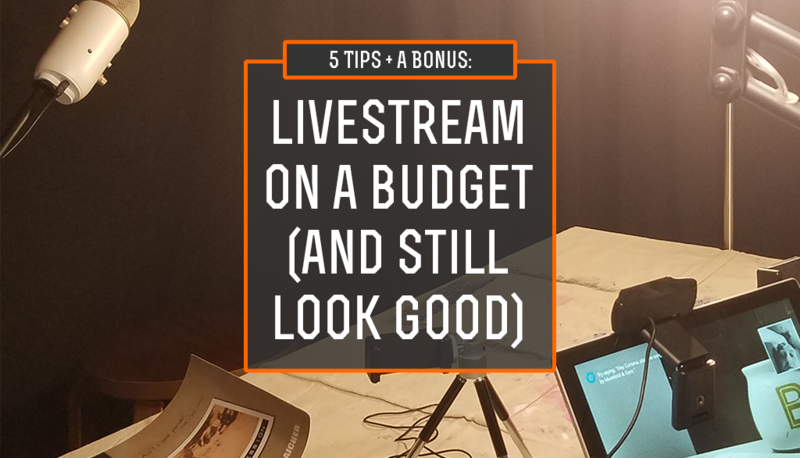 Of course not every event needs to be “professional” – it all depends on the circumstances … but for those who do want to go live (and look good doing it) it’s really not that hard to do – even on a budget. Have you ever gone live for an event? What have you learned from your experiences?